Situated within the dazzling-theatre district and only a short walk from the Royal Opera House, Soho and London’s vibrant shopping district, Boulevard Brasserie is perfectly located to enjoy an Afternoon Tea in Covent Garden. 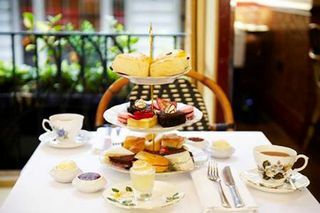 Enjoy a choice of fine teas and coffees, accompanied by a selection of savouries, freshly baked scones with clotted cream and strawberry preserve and an assortment of homemade miniature cakes and tarts. (4 mins) Turn right on Long Acre, and 100m down turn right again onto Bow Street/Wellington Street. Boulevard Brasserie is just after the zebra crossing on your left.